Syllabus documents - Stage 6 Ancient History syllabus with Ancient Near East focus. See our map of the sites named in the syllabus here. Samaria served as the capital of the northern kingdom of Israel from the rule of Omri (c.875 BC) to the destruction of the kingdom (722BC). The site was excavated by Reisner and Fisher in 1908-1910 and by Crowfoot in 1931-1935. A royal complex was unearthed on the summit of the hill. Alongside the acropolis there was also a large lower city. It is disputed whether the royal complex stood in the heart of a large city from its first stage of construction, or whether ninth-century Samaria encompassed only the royal compound and the site expanded beyond the summit only in the first half of the eighth century. The royal complex, constructed during the ninth century BC, includes the palace, storerooms and administrative structures, as well as a casemate wall surrounding the compound. The archaeological remains attest to Samaria’s role as the capital of the kingdom: Monumental stone buildings were uncovered. The part of the palace that was exposed is ca. 55x40m in size. It is one of the largest Iron Age buildings known in the Levant. It was surrounded by several auxiliary buildings of an administrative nature. The architecture is similar to that found in Jezreel, and in two sites in Moab – all built by the Omrides. The artefacts also attest to the unique nature of the site: In one building, ivory carvings were found. In another building the "Samaria Ostraca" were found. These ostraca indicate that a large amount of produce was concentrated in the site. The city was captured and destroyed by the Assyrians in 722-720 BCE. A. Faust (2012), The Archaeology of Israelite Society in Iron Age II, p.46. Find it here. A brief summary of the role and architecture of Iron Age Samaria. I. Finkelstein (2013), The Forgotten Kingdom: The Archaeology and History of Northern Israel, pp. 87-94. Find it here. New thoughts on the architectural elements of Iron Age Samaria. Includes maps, images and figures. The establishment of a new capital in Samaria. Look up any biblical verse here. Tirzah served as the capital of the Kingdom of Israel for a period of 40-50 years (circa 920-880 BCE). The biblical town is identified with Tel el-Fra’ah, located in the northern highlands, in a fertile valley near two springs. This was the capital of Israel before Samaria was built by the Omrides. This makes it a crucial place for the study of the early days of the kingdom. The site was excavated by De Vaux between 1946-1960. According to Finkelstein, it dates to the second half of the 10th century and the early 9th century BCE. The archaeological evidence from this time is sparse as it was apparently a small unfortified settlement. The settlement of the next period was denser and better planned. Tirzah must have been chosen to serve as the capital due to its advantageous environment and its location on the main road to the Jordan Valley. However, so far, no signs of public architecture from the phase when Tirzah was the capital have been unearthed. On the other hand, a large number of seals have been discovered from this period, indicating the possible existence of a bureaucratic apparatus. This could speak to the nature of the kingdom itself at this point: a territorial entity, ruled from a humble settlement, which nevertheless was strong enough to expand and rule territory in the Jezreel Valley. Tirzah lost its importance in the early ninth century BCE, when Omri (884-873 BCE) moved the capital to Samaria. I. Finkelstein, (2013), The Forgotten Kingdom: The Archaeology and History of Northern Israel, pp.63-82. Find it here. An overview of the archaeology of Tirzah and the background on the Kingdom of Israel in its early days, when it was controlled from Tirzah. A. Chambon (1993), "Far'ah, Tell-el- (North)", in New Encyclopedia of Archaeological Excavations in the Holy Land, vol. 2, p.433 and 439-440. Find it here. Identification and history of the site and description of the finds of the different periods. Joshua captures the city of Tirzah. Tirzah is the capital of Israel. The ancient town Shechem has been identified at Tell Balatah, in the modern day city of Nablus. Itis located in the central hill country, strategically situated on the road between Mount Ebal and Mount Gerizim. It is mentioned in the bible in relation to Abraham (Gen 12:6), Jacob (Gen 33:18-20, 35:1-4) and Joseph (Gen 37:12-17). While the historicity of these stories is dubious, the mentioning of Shechem in them makes clear that it was part of the Israelite lore as a prominent sanctuary center, related to Israel’s heritage. Shechem is also mentioned in stories indicating its role as a place where one goes to establish his right to rule the region (Abimelech in Judges 9; Rehoboam and Jeroboam in 1 Kings 12). Shechem is named as the city Jeroboam built as the first capital of the Northern Kingdom (1 Kings 12:25). With the rise of a new dynasty in the days of Ba’asha the capital moved from Shechem to Tirzah. However, there are no archaeological finds from Shechem from the tenth century BCE to indicate its position as a capital. E.F. Campbell (1993), "Shechem", in New Encyclopedia of Archaeological Excavations in the Holy Land, vol. 4, pp.1345-1346 and 1352-1353. Find it here. History of Shechem and results of excavations at the site of Shechem. Sechem is mentioned as the first place Abraham came to in Canaan. Jacob purchased a parcel of a field in Shechem and erected an altar there. Joseph went in search of his brothers who had gone to feed their flock in the fertile fields of Shechem. The Israelites make a commitment to Yahweh at Shechem. Abimelech goes to Shechem to establish his right to rule. Rehoboam and Jeroboam go to Shechem to establish the right to rule. Tel Megiddo is located on the western margin of the Jezreel Valley of inland northern Israel. Due to its strategic position on one of the key trade routes of the ancient Near East, it developed into an important regional urban center. In the Iron Age II it served as an administrative center of the Northern Kingdom of Israel. Yadin, who excavated Megiddo in a few short excavation seasons in the 1960s, attributed the construction of Stratum VA‒IVB to King Solomon. This city was surrounded by a casemate wall with a six-chambers gate and it included two palaces. The Solomonic city, according to Yadin, was destroyed during Pharaoh Sheshonq’s campaign (926 BC). Yadin linked a fragment of a stele of Shishak found during earlier excavations to this event. On top of the ruins of the Solomonic city, Stratum IV was constructed, with large stables, fortifications, a water system and a governor’s residence. This was the city of the Kings of Israel until its final destruction by the Assyrian king Tiglath-Pileser in 732 BC. I. Finkelstein has excavated the site of Tel Megiddo for the last two decades. He has shown many historical problems with Yadin’s reconstruction. Based on the similarity to the palace of Kings Omri and Ahab at Samaria, and pottery comparisons, Finkelstein associated palaces of Megiddo with the Omrides and assigned a later date of ninth century BC. In addition to comparisons with other sites, Finkelstein used Radiocarbon tests to date the layers of Megiddo accurately. He dated the palaces of Megiddo to the first half of the ninth century BC. The destruction of this layer, traditionally associated with Sheshonq’s campaign, was re-dated to the middle of the ninth century BC and associated with the campaign of Hazael, king of Aram. Y. Yadin (1970), Megiddo of the Kings of Israel, pp.93-96. Find it here. Yadin’s reconstruction of “Solomonic Megiddo” following his excavations at the site. I. Finkelstein (2009), "Destructions: Megiddo as a case study", in Schleon (ed. ), Exploring the Longue Duree, Essays in Honor of Lawrence E. Stager, pp.113-126. Find it here. On the dating of the Iron Age IIA destruction layer in Megiddo. See especially 'The Tel Aviv University Excavations', pp.117-118. I. Finkelstein (2010), "A Great United Monarchy? Archaeological and Historical Perspectives", in Kratz and Spieckermann (eds. ), One God – One Cult – One Nation: Archaeological and Biblical Perspectives, pp. 3-28. Find it here. pp.3-14: A reappraisal of the traditional theory regarding the United Monarchy and the problems with it. Discussion of the role of Megiddo in this period and the interpretations of the archaeological finds from Megiddo. pp.19-20: General concluding notes on the character of the United Monarchy. King Solomon taxed a levy on the kingdom in order to fortify Megiddo amongst other places. Jerusalem in the tenth century BC is the topic of much controversy. It sits atop the Judean hills and is relatively isolated and easily guarded. According to the biblical narrative, it was the capital of the united monarchy, conquered by David (2 Samuel 5:6-9), who renamed the city 'Jerusalem' and made it the religious centre of the kingdom. Solomon then proceeded to build it into a magnificent capital with a temple dedicated to the worship of Yahweh (1 Kings 9:15). The Stepped Structure is a large structure built along the slope of the hill which includes an outer sloping stepped structure and below it a supporting substructure of stone ‘boxes’ filled with stones. The purpose of the structure was probably to support foundations of a large building constructed on top of the hill. The Large Stone Structure is a building excavated on the summit of the hill. Only a few walls were preserved of this structure. The excavator (Eilat Mazar) presented it as a large building, constructed in the Iron Age (IIA) and connected it with the Stepped Structure, creating one large architectural complex. He therefore identified it with the palace of king David. In opposition to this reconstruction, Finkelstein and other scholars have shown that the actual remains found are problematic to date and reconstruct due to the many later disturbances. He showed that they might belong to several separate periods and do not make up one large architectural complex. This argument is crucial to the understanding of the nature of Jerusalem in the days of “the United Monarchy” and thus of the monarchy itself: Was it a kingdom ruled from a fortified center, albeit a small one, or was Jerusalem a remote highland village with no evidence to its position as a capital in the tenth century BC? The archaeology of Jerusalem as a royal capital from the eighth century BC is much clearer, with the city expanding to its maximum size, fortifications and small finds which indicate an administrative system. However, this capital already belongs to the Kingdom of Judah and it thrives mostly after the fall of the Kingdom of Israel in 722BC. A. Mazar (2010), "Archaeology and the Biblical Narrative: The Case of the United Monarchy", in Kratz and Spieckermann (eds. ), One God – One Cult – One Nation: Archaeological and Biblical Perspectives, pp.29-58. pp.29-30: A brief overview of approaches to the biblical narrative in relation to the archaeological finds. pp.34-46: A defense of E. Mazar’s reconstruction of the Stepped Stone Structure and the Large Stone Structure as being part of the same architectural complex, dated to the United Monarchy. See p.36, fig.1 for an image of the remains of the Stepped Stone Structure. pp.51-52: A view on the possible nature of the United Monarchy in light of the meager archaeological evidence. I. Finkelstein (2011), "The 'Large Stone Structure' in Jerusalem: Reality versus Yearning", Zeitschrift des Deutschen Palästina-Vereins vol.127, pp.1-10. Find it here. Presents the arguments against the Mazars’ reconstruction of the Large Stone Structure and Stepped Stone Structure. See fig.1 for the remains of the Large Stone Structure. Like Jerusalem, Beersheba is located in the southern kingdom of Judah rather than the northern kingdom of Israel. It is located deep in the Negev desert in the south of modern Israel. Archaeological excavations have revealed several strata (layers) of occupation, including Stratum VII, which has been dated to the early part of the Iron IIA (950‒900 BCE). The settlement of this stage is characterized by the arrangement of the houses in a “belt” around a central open space, creating a pattern known as an “enclosed settlement”, typical to many highland sites at this period. This settlement was part of an extensive wave of rural settlements, unusual for this arid area, which encompassed the Negev Highlands and Nahal Besor. A settlement at nearby Tel Masos, which was the largest and most complex site in the area at this phase, was apparently the center of this system. Finkelstein has suggested that this settlement array formed a territorial-political entity. He linked the emergence of this local desert polity with the southern Levantine copper industry that thrived during the 12th–9th centuries BC at sites along the Arabah Valley. The end of this settlement system was attributed by Herzog to a worsening of climatic conditions combined with pressure put on the area by Egypt (an example of this is Shosenq’s campaign). The next stratum, Stratum VI, demonstrates a transitional phase in which little construction took place within the remains of the Stratum VII town. Stratum V already represents a fortified city belonging to the kingdom of Judah. Z. Herzog (2016), "Social, Historical and Cultural Ramifications", in Beer-Sheba vol.III, pp.1457-1459. A summary of the nature of settlement at Beersheba in the different periods and the historical implications. M. Martin and I. Finkelstein (2013), "Iron IIA Pottery from the Negev Highlands: Petrographic Investigation and Historical Implications", Tel Aviv vol.40, pp.6-45. See esp. pp.6-10 and 38-39. Research on the pottery from southern Israel in early Iron IIA in order to establish its origin and its relation with the copper production in Wadi Arabah. A. Fantalkin and I. Finkelstein (2006), The Sheshonq I Campaign and the 8th-Century BCE Earthquake: more on the Archaeology and History of the South in the Iron I-IIa, pp.24-26. Some background on the “Desert Polity” centered around Tel Masos and its relation to the copper industry. For much of the history of the ancient Near East, including Israel, the structure of society was centred on the idea of the household, not only in terms of everyday life but in terms of how people actually understood society to be formed. A kingdom was understood to be one great household encompassing all its citizens, and this dictated how the kingdom was actually governed. The king was quite literally the father of this household, so as per the language of the household his royal retainers were his ‘sons’ (both biological and not) and ‘servants’. The same sort of networks built around kinship and the household made up the citizenry that formed the population of this great household. Not only royal dynasties themselves but the entire kingdom can be referred to as simply the House of the dynastic founder, hence the kingdom of Judah is also called the House of David. Ancient Near Eastern kings had a special role in their kingdom’s own little world because they had a direct relationship with the national gods or, in the case of Israel, the one god, YHWH. YHWH was the patron of the king and so the king ruled only by the favour and decision of YHWH, just as YHWH, like any patron god in the ancient Near East, was ultimately the one who enabled the king’s successes, especially in war. In the books of 1-2 Kings, descendants of David continued to rule Judah for hundreds of year after his death, up until the fall of the kingdom in 586 BC. David was so revered that he was used as the yardstick by which to judge the life of his descendants, primarily by the degree to which they replicated David’s righteousness in the eyes YHWH. Megan Bishop Moore, ‘Judah and the House of David’, Bible Odyssey, (Society of Biblical Literature, 2017) https://www.bibleodyssey.org/en/places/related-articles/judah-and-the-house-of-david Moore discusses the Davidic dynasty and its role in Judah. 1 Kings 12:20 The kingdom of Judah = House of David. Look up any verse here. King Asa of Judah is judged positively because he was like David. In the ancient Near East, a temple was literally understood as a house for god to which it was dedicated; the Temple of Solomon (also called the First Temple) was no different, called a ‘house for the name of YHWH’ (1 Kings 5:5). Being located in Jerusalem, the temple and YHWH’s presence is closely tied to the ruling Davidic dynasty, which enjoyed a special relationship with the national god. There is a strong theme running through the books of Samuel and Kings that the temple in Jerusalem is to be the one and only sanctioned place of worship of YHWH and as a result there is an opposition to the existence of rival places of religious practice that would be associated with ‘pagan’ Canaanite gods like Baal and Asherah. When Jeroboam broke the northern tribes of Israel away from the House of David, he recognised the danger of his people needing to go to the temple in Jerusalem to offer their sacrifices, so he constructed two new places of worship at Dan and Bethel, at the southern and northern ends of his new kingdom. So between the kingdoms of Israel and Judah there were two contrasting approaches to what might loosely be called ‘national religion’: in Judah, religious practice was very centralised, aimed only at the one temple in the royal capital, Jerusalem, giving a small cadre of priests control over affairs. In Israel by contrast, such practice was decentralised and outside the immediate oversight of the king. This centralisation seems to have been more an ideal than a reality for much of the First Temple’s history, as there is abundant Iron Age evidence even in Judah for religious practice, even temples (at Arad in the south and at Moza in Benjamin) outside of Jerusalem itself. Carol Meyers, ‘Temple, Jerusalem: Role in National Life’, in Anchor Bible Dictionaryvol. VI, pp. 350-369. pp. 360-364: A discussion of the symbolic and political role of the Jerusalem Temple. 1 Kings 12:26-29 Jeroboam builds the alternative religious centres to Jerusalem. King Hezekiah of Judah takes down the places of ‘pagan’ worship. Although prophets in ancient Israel could be multifaceted and none totally alike, at the core of being a prophet was conveying the authentic word of YHWH, whether to a specific group or person, especially the king, or to the people of Israel in general. The prophet acted as a conduit by which YHWH communicated with the earthly realm. In particular, prophets often conveyed YHWH’s displeasure at the conduct of his people and a call for their return. This was very much the theme of the 9th century prophet Elijah’s life, in his criticism of the worship of the foreign god Baal within the royal house of the northern kingdom of Israel, as opposed to YHWH. This culminates in a dramatic contest between Elijah and the prophets of Baal to see which god will perform a miracle. The pleading of Baal’s prophets produces no result, while YHWH responds immediately to Elijah’s request for a miracle. At the end of his life, Elijah hands his prophetic commission over to Elisha to continue as YHWH’s advocate. Prophets could also focus on calling out social injustices. The 8th century prophet Amos repudiated the economic abuses he saw going on around him as the gap between rich and poor grew, in violation of protections written into the law found in the Torah. For Hosea, the theme of the people’s unfaithfulness to YHWH is related to the northern kingdom’s of Israel’s political actions, which showed a lack of faith in YHWH and loyalty to the covenant he had made with his people. Houston discusses this important theme in prophetic literature. Huffmon discusses what makes a prophet a prophet. Amos 8:5 Amos speaks of price manipulation. Elijah’s contest with the prophets of Baal on Mt Carmel. Israel and Judah didn’t have what would be recognisable now as a full-time, professional government bureaucracy. Although a small group of men close to the king held titles, these were not offices in the modern sense to which someone was appointed on merit but rather roles that signified the person’s close personal or familial relationship with the king. For example, many of Solomon’s retainers had a connection to him because they had been close to his father David. In the system of districts he used to govern the country, some of his governors had married into the royal family. Like the wider ancient Near East, agriculture, the production of food to subsist on, was the dominant concern of most if not all households in ancient Israel. Activities that today might be called a ‘profession’, ‘trade’ or ‘craft’ were practiced more part-time, from making pottery to presitigous objects like jewellery. The sorts of goods produced might be traded, given as gifts or even given as payment for renting land. The main context in which a person would do something like this full-time was when they were working in the service of the king, who would provide for them out of his own supplies. Solomon made extensive use of this forced labour or ‘corvée’. When Solomon is building the Temple in Jerusalem, a man named Hiram comes from Tyre to craft all the Temple’s bronze objects. As the king of Tyre was helping Solomon build the temple in exchange for food and land, Hiram would have been doing this work as royal service to the king of Tyre. Ahimaaz, one of Solomon’s district governors, was married to Solomon’ daughter. Hiram comes and makes all the bronze objects for Solomon’s Temple. Like the ancient world in general, Israel was a patriarchal society, meaning men held a greater degree of power by default, especially the heads of households. Property and agricultural land that was used to feed the household was inherited first by any sons, and when women married they moved to live with their husband’s family. This made women’s lives generally dependant on what happened to the male members of their household, and an unmarried woman might have to become a servant in another household. Archaeology has revealed the kind of household activities that are likely to have been the domain of women, especially cooking, bread making, weaving and religious activities in a household shrine. Associating particular spheres of daily life with gender roles is, however, difficult to do definitively. In the royal household, males inherited the throne and positions in the king’s immediate administration. As in the wider ancient Near East, royal marriage was a matter of political expediency, used for forging or strengthening contacts with foreign kingdoms or important local clans. Royal wives seem to have played a relatively important role the conduct of royal affairs judging by the fact that the mother of most kings of Judah is provided in the books of Kings, while Solomon’s mother Bathsheba was instrumental in making him the successor to his father David. One queen-mother, Athaliah, even seized the throne for a time after her son was assassinated. Meyers discusses the archaeological evidence for women’s activities. Solvang discusses the role of royal mothers. An Israelite woman directly references her baking. Bathsheba negotiates for Solomon to be heir to David’s throne. Athaliah seizes the throne of Judah, to become the only ancient Israelite queen ruling alone. Biblical texts provide minimal information about exactly how the military in Israel and Judah were structured, recruited and equipped, but some information can be gained or at least inferred from extra-biblical sources. Except in the case of David, who had a group of loyal foreign warriors that acted as his elite infantry, neither Israel nor Judah had what would be recognisable as a permanent, ‘professional’ army as we know today. Instead, the army was more likely made up of a militia of men conscripted from among the tribes who fought together in units based around their local clans. Serving for a time in the army, whether on campaign or manning isolated forts that dotted the landscape, was a way that someone could fulfil their obligations to the king, who was the commander-in-chief. In addition to these forts, like Arad in the south of Judah, archaeology provides other indications that military concerns were a constant. The Iron Age city of Megiddo is a good example as it was both fortified against attack and hosted what appear to be stables of a force of chariots, an important and popular type of unit for fighting in flat-open lowlands like the Jezreel valley surrounding Megiddo. At cities that are known to have been conquered, including Lachish and Jerusalem, evidence of combat appears in objects like arrowheads and slingstones. Brad Kelle, Ancient Israel at War: 853-586 BC (Osprey, 2007), pp. 20-22. Kelle discusses the armies of Israel and Judah. In ancient Israel, as with the ancient Near East more broadly, agriculture was the primary concern of every household and would have taken up most of its time and effort. There was no real market in which to sell and agricultural products and food as is the case today, so every household needed to make use of its land to feed itself. As such, agriculture was the main occupation of the vast majority of the population. This made access to fertile land a central concern, and some Israelites and other peoples around them were mobile pastoralists who moved around to find land for grazing their herds. Geographically, the lowlands that surrounded Israel’s core territory in the hill country of Palestine were better for growing crops, but the Israelites made their highland home more productive by clearing forests and building terraces on the side of the hills to farm on. Unlike in Mesopotamia, fields were not irrigated with canals. Instead water was collected from unground springs that served some settlements and rain was collected in large cisterns cut into the rock. Rain only falls in the wet season, in winter and autumn, and could vary drastically from year to year, and springs can dry up during the summer months. Because of this and other dangers like locusts, the threat of crop failure and famine was always very real. Primary crops include wheat, legumes, barley, olives, grapes and figs, while Israelites also kept sheep, goats, cattle and oxen for ploughing. Oded Borowski, ‘Agriculture’ in Anchor Bible Dictionary vol. I, pp. 95-98. Borowski reviews the details of agricultural practice in Israel. Ebeling discusses agriculture’s place in life and its dangers. A list of all the agricultural products supplied to Solomon and his household. The importance of having the fields ploughed when the autumn rains come to water them. Solomon’s prayer makes references to locusts and animal diseases. Crafts in materials like wood, stone and ivory and working with metal where done in the primarily within the household, supported by the household’s agriculture, more part-time as opposed to being professions in the modern sense. In the later periods of the Israelite monarchy, such activities began to be done on a more organised, full-time scale. Outside the household context there was a need for those with skills in building, so especially in wood and stone, on royal construction projects, the results of which can be seen at sites like Samaria, Megiddo and Lachish. Unlike other parts of the ancient Near East, Israel was in a region where there was abundant supply of wood and stone, and metals like Iron and copper were reasonably accessible. The Hebrew Bible does not refer to such skilled labourers very much so it if difficult to glean much information on this topic. For example, 2 Samuel 5:11 uses the same word for craftsmen who work with either wood or stone, while 1 Samuel 13:19 uses that same term again for what would now be referred to as a blacksmith. Wood rarely survives in the archaeology of Israel so it is difficult to know what was carved from it and how. The best evidence comes from stone carving for buildings and for evidence of metal production, both the products (like weapons) and the tools of production. This includes the remains of bellows, which was like a diaphragm made from a skin fitted over a clay vessel that could be raised and lowered to force air through a pipe into the furnace. Tuyeres, which were the fitting between the bellow and the pipe, are also sometimes found. C. J. Davey, ‘Some Ancient Near Eastern Pot Bellows’, Levant XI (1979), pp. 101-111 (pp. 101-102). Davey explain how the kind of ancient pot bellows that were used in Israel and the Near East work. Morris Silver, Prophets and Markets (Kluwer-Nijhoff, 1983), pp. 17-18. Morris reviews archaeological and biblcial evidence for metalworking in ancient Israel. Carpenters (craftsmen of wood) and stonemasons (craftsmen of stone). Blacksmith (just called a craftsman). There was a long tradition of impressive engineering projects to create easier access to water in the area in and around Israel in the Bronze Age and this continued into the Iron Age, when the kingdoms of Israel came to be. One such recently-excavated example of a massive water system from the Bronze Age can be found at Gezer, a huge shaft dug down to reach the water table. The Siloam Tunnel in Jerusalem was built in the 8th century BC and is generally agreed to be the channel for brining water into the city built by Hezekiah according to 2 Kings 20:20 in preparation for impending Assyrian attack, and hence it is also called Hezekiah’s Tunnel. An ancient Hebrew inscription found in the tunnel in the 19thcentury memorialises the point at which the two teams of workers excavating the tunnel through bedrock met each other. The tunnel starts near ancient Jerusalem’s primary water source, the Gihon spring, on the eastern side of the City of David ridge. From there it carried water inside the city’s defences to the Siloam Pool at the City of David’s southern end. It was only the latest of a series of water engineering and defensive works for the Gihon spring, and was built to make access to water from within the city’s defences easier and to alleviate dangers to access to the spring in the case of an attack on the city. Ronny Reich, Eli Shukron, ‘Light at the End of the Tunnel’, Biblical Archaeology Review 25 (1999), pp 22-28. Yigal Shiloh, ‘Jerusalem: Water Supply Systems’, New Encyclopaedia of Archaeological Excavations in the Holy Land vol. 2, p. 329-332. Although it made it a target, Israel’s geographic position between Africa, Arabia and the Near East gave it an enviable position in international trade, even if Israel didn’t always control the trade routes themselves. For much of Israel’s history such trade didn’t take place in a market setting of ‘buy low, sell high’ in order to turn a profit as is the case in the modern world, but more a matter of social custom in terms of how ‘prices’ were set. Trade functioned as a way to get hold of resources that were needed, like metals that were only produced in certain areas, or prestigious items that could be used as gifts or to pay the required tribute to imperial overlords like Assyria. For a long time, international trade in the ancient Near East was largely the domain of kings, where it functioned as a way to maintain relations with other kings. During the period of ancient Israel, the places that were most prominent in international trade were Cyprus and the Greek world, mostly through the Phoenicians, who spread a wide net in the Mediterranean mostly by establishing colonies. The best archaeological indicator of trade comes from pottery, and in Israel it is common to find Greek, Cypriot and Phoenician pottery that would have been traded either for its own aesthetics or for what was carried inside, like perfumes that are now long gone. Israel and Judah probably didn’t have any sort of trade that could be easily detected archaeologically, while Assyrian pottery likely did start to be important to some degree after the fall of the northern kingdom of Israel since Assyrian pottery began to be copied locally. Vadim Jigoulov, ‘Colonization, Phoenician’ in The Encyclopedia of Ancient History, pp. 1672-1673. During the period of the Israelite monarchy, several cities were built or rebuilt with fortifications, which can be divided into two rough types: either the city wall was solid or it was a ‘casemate’, essentially a pair of parallel walls with cross-walls at right angles, forming a series of rooms (casemates). Such cities also had large gate structures that featured pairs of open chambers across from each other on either side of the central passageway that led into the city. These chambers could have been used for storage, exchanging goods, and sometime they had benches. The walls of the chambers supported rooms above the gateway itself. Inside these cities were houses, silos for storing grain harvested in the fields around the city, and other larger buildings that served administrative functions and probably as residences for some local or regional governor. Such administrative buildings include long structures divided within by rows of pillars. These buildings were probably used for storage of things like the taxes to the king that people paid with part of the agricultural produce of their household. A series of such buildings found at Megiddo have been interpreted as stables, an identification suggested by elements such as what appear to be horse-troughs. Although the subject of some debate, it appears now more likely than not that these are stables for the chariot forces of the 9thcentury BC kings Omri and Ahab. Fortified cities like Megiddo acted as strongholds at strategically important points in the landscape as well as centres in the kingdom’s administrative network. Gabriel Barkay, ‘Iron Age II-III’ in The Archaeology of Ancient Israel, pp. 302-373 (pp. 305-315). Barkay reviews the archaeological aspects of such fortified cities. Deborah Cantrell, ‘Stable Issues’ in Megiddo IV vol. II, pp. 630-642 (pp. 630-637). Cantrell discusses how the pillared buildings at Megiddo would have functioned as stables. Yahweh was the major god of the Kingdoms of Israel and Judah. Private names found on seals, seal impressions, and other written documents in Judah (mostly from the eighth century BCE and later) include in many cases the theophoric ending -yahu, while in northern Israel the common ending is -yo. Both reflect belief in the god of Israel, Yahweh, the national god of both kingdoms. However, in northern Israel, where the older Canaanite legacy was stronger, we find also private names with Canaanite theophoric endings like Baal. Indeed, the population of the Northern Kingdom included many indigenous Canaanites, who inhabited the main northern valleys. In addition, Israel was heavily influenced by nearby Phoenicia. Israelite religion went through several stages of development. The worship of Yahweh alongside a consort named Asherah is known from the inscriptions at Kuntillet ‘Ajrud, a fortified citadel-like structure in the eastern Sinai desert dated to the first half of the eighth century BC. This unusual and remote site, located on the main highway between Gaza and the Red Sea, seems to have been used as a roadside station, but was also a place of religious activity. The material culture of the site reflects a strong influence originating in the northern Kingdom of Israel, in spite of its far southern location. Ink inscriptions and paintings found on the white plaster of the walls, as well as on large pottery containers and a stone trough, contain dedications, prayers, and blessings. Some of the blessings are addressed to “YHWH of Teman and his Asherah” or “YHWH of Shomron (Samaria) and his Asherah”. A similar combination of Yahweh and Asherah appears also on an inscription from a cave at Khirbet el-Kom (biblical Makedah?) in the Shephelah. This evidence indicates a strong continuity with Canaanite religion, where El was the head of the pantheon and Asherah was his consort, and reflects a theology that is substantially different from the pure monotheistic religion as it is preserved for us in the Hebrew Bible. While the worship of Asherah was condemned by the Jerusalem prophets, they probably represent the new theology that was emerging towards the end of the monarchy among the Jerusalem intellectual elite, while the popular religion embraced by ordinary people was much more traditional, preserving indigenous ideas and beliefs rooted in Canaanite religion. The formulas “YHWH of Shomron” and “YHWH of Teman” indicate that YHWH at the time was considered a deity with local “representative”. This concept is indicated in the bible as well, for example: “The mountains dripped before YHWH of Sinai” (Judg. 5:5 - considered one of the oldest parts of the Hebrew bible). In opposition to this old theology we find verses such as “Hear O Israel, YHWH is our God, YHWH is one!” (Dt. 6:4), as a reaction against the view that recognized god as having various local manifestations. The verse represents well the Deuteronomistic school of thought (originating from the book of Deuteronomy in the seventh century BC) which encouraged centralization of worship and strict monotheism. Evidence for local cult places and places of worship near city gates or in open areas inside the city has been found at several sites, such as Dan, Tel Reḥov, Megiddo, Samaria, and Lachish. The use of standing stones, or biblical masseboth, has been detected at several of these places, for example, the city gates of Dan and Bethsaida (a large Aramean [Geshurite?] city north of the Sea of Galilee). 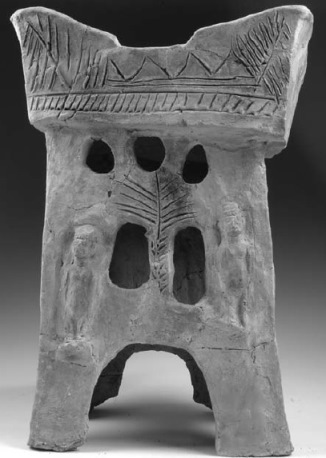 Like Asherah, the masseboth were opposed by the prophets as symbols of a foreign (Canaanite) cult; however, their presence at these sites indicates that these standing stones were popular in both Israel and Judah. Excavations at Tel Rehov, in the Beth Shean Valley in northern Israel, revealed a large Israelite Iron IIA town. Much evidence of cult and religious practices was exposed in the structures of this site. An open-air sanctuary was uncovered in area E, including cult installations such as an altar, standing stones and an offering table. Alongside the sanctuary, evidence for domestic and private cult was revealed in the houses that were excavated. These include pottery altars, a model shrine, cult stands and other objects. The cult objects in Tel Rehov present a continuity with Canaanite material culture and religious practices. Hundreds of clay figurines found in both Israel and Judah representing naked women are probably related to the popular cult of Asherah. In the Northern Kingdom, the artistic style is rooted in Canaanite art and probably inspired by contemporary Phoenician art. Naked female figurines are also the main decorative motif on clay altars from the tenth to ninth centuries found at Tel Reḥov and Pella. These altars often have four horns, like the similar stone altars found at several sites. Such altars were used for burning incense or for making small sacrifices in residential cult corners, and they should be seen as part of the popular religion of the time. In a few other cases, such altars were more elaborately decorated, like the two tenth-century pottery altars found at Taanach, which yielded rich iconography rooted in the Canaanite art. During most of the monarchic period, Israelite religion, though centered on the national god Yahweh, was based on Canaanite myths, beliefs, and cult practices, and a great goddess was worshipped alongside the main male god. A major change took place during the late-eighth and the seventh centuries BCE in and around Jerusalem, with the centralization of cult at the temple of Jerusalem. The inscriptions and artifacts related to cultic practices show that Israelite monotheism was a product of a long and gradual process. Jerusalem during Josiah’s reign is considered by many as the time and place when Judahite religion consolidated and became the foundation for further development into monotheistic Judaism as we know it. I. Finkelstein and A. Mazar (2007), The Quest for the Historical Israel: Debating Archaeology and the History of Early Israel, pp.174-179. Find it here. An overview of the characteristics of Israelite religion, its development and important sites. Z. Meshel (2012), Kuntillet ‘Ajrud (Horvat Teman): An Iron Age II Religious Site on the Judah-Sinai Border, pp.XXI-XXII and 129-135. On the site of Kuntillet ‘Ajrud and its cultic finds. A. Mazar, (2015), "Religious Practices and Cult Objects during the Iron IIA at Tel Rehov and Their Implications regarding Religion in Northern Israel", in Hebrew Bible and Ancient Israel, Vol.4, No.1, pp. 25-55. See especially the figures on pp.49-53. Find it here. The result of excavations at Tel Rehov in the Jordan Valley. Archaeological finds date to the 10th–9th centuries BC and relate to religious practices, including cult objects and iconography. The evidence relates to the private (domestic) as well as public sphere and includes an open-air sanctuary, pottery altars, a model shrine, clay figurines, Egyptian amulets, seals and a few inscriptions. The priests carried out the cult functions at the temple. In ancient Israel this included the system of sacrifice and offerings. From sources relating to Second Temple period, we know that these include the daily offerings and the special offerings on the Sabbath and festivals. They were also the personnel of the temple, alongside the Levites, who attended to supplies, storage, repairs and other necessities to facilitate the smooth function of the temple. In texts associated with the early days of the monarchy another role is mentioned for the priests: different forms of divination meant to provide divine answers. Several biblical examples demonstrate how the priest and the prophet were not always entirely separate roles, for example, Samuel preformed cultic functions (e.g. 1 Samuel 2:11), anointed King Saul (1 Samuel 10:1), acted as a judging authority and was consulted on prophetic matters. In addition, in spite of the negative view of the bible towards temples outside of Jerusalem, we know they thrived and had their own priestly personnel, probably fulfilling similar functions to the priests of the Jerusalem temple. The prophet in ancient Israel was a mediator claiming to communicate messages received by various means directly from god. The prophets delivered these messages to recipients, often the king, but also ordinary individuals. While the bible gives an impression of the prophets as social critics and ethicists, the prophetic books are not necessarily the products of the prophets themselves, but rather of scribes who wanted to emphasize certain aspects of their activity. The text often labels the prophets as “true” or “false”, but these represent theological judgement and do not indicate what was the actual importance of the prophet in society. L.L. Grabbe (1995), Priests, Prophets, Diviners, Sages: A Socio-Historical Study of Religious Specialists in Ancient Israel. pp.41-53: discusses various roles of priests referred to in the bible. pp.57-60: on the roles and status of priests in the Jerusalem temple and in temples outside Jerusalem. pp.64-65: summary on the role of the priest. pp.66-72: several examples of biblical prophets. pp.82-84: the role of the prophet in the biblical texts. pp.116-118: concluding remarks on the role of the prophet. The term Bamah (“High Place”, plural: Bamot) appears 97 times in the Hebrew Bible. It is a built man-made place of worship. In at least some of the cases, it is described as a public building which included a large hall, an altar and some priestly personnel. These were built in the cities, such as Gibeon and Bethel. Even though the bible mentions an altar and a Bamah at Bethel (2 Kings 23:15), excavations at the site yielded no evidence to an Iron Age cult center. The cultic place in Dan is not explicitly labeled as a bamah in the bible. It is listed alongside Bethel as one of two places where Jeroboam I installed a golden calf and instituted a cult place. The only public, monumental temple excavated so far in northern Israel is the one discovered at Tel Dan. It was identified by its excavator, Avraham Biran, as the temple erected by Jeroboam I at the end of the tenth century BC. Even if this precise foundation date of the temple at Tel Dan may be questioned, the existence of a major temple at Dan during the ninth and eighth centuries BC is beyond question. The temple enclosure features a podium built of ashlar stones that probably supported a shrine, which might have contained the “golden calf” mentioned in 1 Kings 12:29. In a spacious courtyard at the front of the temple, there was a large sacrificial altar with four horns, the latter being an essential part of the altar in the bible. Subsidiary rooms at the side of the enclosure were used for ritual and other cultic functions. L.S. Fried (2002), "The High Places (Bamot) and the Reforms of Hezekiah and Josiah: An Archaeological Investigation", Journal of the American Oriental Society, vol.122, no.3, pp.437-465. Find it here. pp.437-441: the meaning of the term “Bamah” according to the different sources. pp.442-443: the find of the “Bamah” from Tel Dan. pp. 443-461: the reforms of Hezekiah and Josiah and the archaeological evidence for it. See also the appendix with list of Judean kings. A. Biran (1974), "Tel Dan", The Biblical Archaeologist, vol.37, no.2, pp.26-51. p.40-43: the cultic finds from Iron Age Tel Dan. A. Biran (1993),"Dan", in New Encyclopedia of Archaeological Excavations in the Holy Land vol.1, pp.327-329. Find it here. On the high place at Tel Dan, including the architecture and finds, including figures. I. Finkelstein and A. Mazar (2007), The Quest for the Historical Israel: Debating Archaeology and the History of Early Israel, p.176. Find it here. On the characteristics of Israelite religion, its development and important sites . The bible presents Solomon’s temple at the heart of the United Kingdom already in the tenth century BC. However, archaeological evidence (or the lack of it), epigraphic evidence and biblical criticism reveal that the immense importance of the city of Jerusalem and its temple are later realities, inserted into the description of earlier periods for ideological and literary purposes. There is no archaeological evidence for the existence of the temple in the tenth century BC, and very little (and highly contested) evidence to support any major construction in Jerusalem during this period. At the same time, the archaeological and epigraphic evidence attest to polytheism (belief in many gods), various types of cult practice and a multitude of shrines all over the country. The idea of the Jerusalem temple as the spiritual heart of the nation comes mostly from the Deuteronomistic books (Deuteronomy - Kings), which was formulated after the fall of the Kingdom of Israel. The Deuteronomistic author promoted an ideology of the Davidic kings as the only legitimate rulers over all Israel and the Jerusalem temple as the only legitimate cult-place. Based on earlier archaeological evidence from the northern kingdom, Nadav Na’aman suggested a political rather than religious explanation for the intentional desertion of destroyed cultic sites. According to Na'aman, it was part of the effort of rulers of the two kingdoms to centralize their rule by minimizing the number of cult places in their territories. In Megiddo two shrines were identified. They were destroyed by the Arameans in the second half of the ninth century BC and deliberately buried following their destruction. At Taanach another cultic structure destroyed by the Arameans was unearthed. Here too its sacred objects were deliberately buried under the ruins. The same phenomenon occurred in a small shrine which was unearthed in Tel 'Amal. Na’aman suggests that it was a royal decision not to restore these sacred sites. Local shrines must have enjoyed prestige, achieved a certain degree of independence and competed with the royal court for economic gains. The king was considered responsible for their maintenance and restoration and had reasons for attempting to reduce their number. However, closing down local sanctuaries in a peaceful situation might have provoked hostility towards the central government. Therefore, Israelite and Judahite rulers took advantage of the foreign destruction of cult places and avoided restoring them for political and financial reasons. I. Finkelstein (2013), The Forgotten Kingdom: The Archaeology and History of Northern Israel, pp.155-158. On the creation of the concept of Biblical Israel, including the centrality and importance of the Jerusalem temple. N. Na’aman (2002), "The abandonment of cult places in the kingdoms of Israel and Judah as acts of cult reform", Ugarit-Forschungen vol.34, pp.585-602. p.595-597: An explanation of the desertion of cultic buildings as a political step taken by the Kings of Israel in order to strengthen their control and power. Hezekiah is a righteous king who destroys cultic places throughout the land to maintain the centrality of Jerusalem. Josiah is a righteous king who purges all forms of cultic worship throughout the land to refocus worship to Yahweh at the temple in Jerusalem. Israelite architecture can be characterized by large, ashlar constructed administrative buildings, such as the ones found in Megiddo and Samaria. (Sharon and Zarzecki-Peleg 2006: 147-156). Capitals are an architectural term usually referring to decorative supports on top of columns. Proto-Aeolic capitals (aka. volute capitals) are decorated with curving date palm tree motifs, associated with the Near Eastern “Tree of Life”. They are among the most impressive and special finds discovered in archaeological excavations in Israel and Jordan. The size of the capitals, their weight, the quality of their carving and their impressive design provide an indication of their function in the gates and palaces of the ancient kingdoms of Israel, Judah, Moab, and Ammon. Stone capitals decorated with a Proto-Aeolic design are known from the main cities of the Kingdom of Israel: Samaria, Megiddo, Hazor, Dan and Mount Gerizim. They date to the 9th century BC. Later examples (8th-7th centuries BC) are known from the Kingdom of Judah: most of them from the remains of the palace at Ramat Rahel and one from the City of David excavations in Jerusalem. Six capitals and a few fragments of capitals are also known from various sites in Jordan. I. Sharon and A. Zarzecki-Peleg (2006), "Podium Structures with Lateral Access: Authority Ploys in Royal Architecture in the Iron Age Levant", in S. Gitin et.al. (eds.) Confronting the Past: Archaeological and Historical Essays on Ancient Israel in Honor of William G. Dever, pp.147-156. pp.147-151: Definition of the typical Israelite administrative building and its architectural elements. pp.151-156: Case studies of typical Israelite buildings in Megiddo, Hazor, Dan, Samaria and Jezreel. R.E. Tappy (2001), The Archaeology of Israelite Samaria vol.2: The Eight Century BCE, pp.491-495. Find it here. On the provenance of the Samaria Ivories and the problem of their dating. V. Muller (1939), "Review: Early Ivories from Samaria, Samaria-Sebaste. Reports of the Work of the Joint Expedition in 1931-1933 and of the British Expedition in 1935, No. 2 by J. D. Crowfoot; Grace M. Crowfoot. ", American Journal of Archaeology vol.43, no.4, pp.705-706. Find it here. A brief overview of the Samaria Ivories and a summary of Crowfoot’s publication about the ivories. O. Lipschits (2011), "The Origin and Date of the Volute Capitals from the Levant", in I. Finkelstein and N. Naáman (eds.) The Fire Signals of Lachish. Studies in honor of David Ussishkin, pp.203-225. Over a hundred inscribed potsherds were found during the excavations in Samaria. They were administrative notations of shipments, of wine or oil, that had been sent in to various officials from their estates. All of the sherds have been discarded and were found under in a fill under the “Ostraca House”. All the texts on the sherds start with the regnal year and list the recipient of the shipment. Some of the ostraca then list the type of commodity sent, different types of oil and wine, while other ostraca ignore the type of commodity, but name the sender. The ostraca refer to names of places and regions around the capital, from which the commodities originated. They are dated according to paleographical considerations to the early eighth century BCE. They attest to a large-scale oil and wine industry at that time. Finkelstein (2013), The Forgotten Kingdom: the archaeology and history of northern Israel, p.132. Game boards and game pieces are found from all over the ancient world, indicating that games were always a part of daily life. Games were made from various materials, including clay, stone, bone and ivory. Games were common through all social classes; ordinary people as well as the elite. Luxurious game sets were perhaps even used as status symbols, while others might have had religious significance. Music was also part of the leisure activities, as indicated by the many biblical references, but also by iconographic and archaeological evidence, such as the depiction of instruments on seals, in figurines of female drummers and the depiction of a procession of players from Kuntillet ‘Ajrud. Music played a significant role in a variety of situations from cultic activities, victory celebrations, secular celebrations and even mourning. J. Braun (2002), Music in Ancient Israel/Palestine: Archaeological, Written and Comparative Studies. Find it here through google books. pp.115-118: On the role and characteristics of music in ancient Israel. pp.151-153: On the drawing of the players’ procession from Kuntillet ‘Ajrud. <https://www.biblicalarchaeology.org/daily/ancient-cultures/daily-life-and-practice/ancient-board-games/> Evidence of board games from Ancient Israel as discovered through archaeological excavations. Julian Reade explores the question: Was Sennacherib a Feminist?